Around 40 students from Garhwal English Medium School were in for a treat as they availed the opportunity to celebrate Children’s Day at newly opened JW Marriot, Mussoorie Walnut Grove Resort & Spa, on the way to Kempty, near Mussoorie, yesterday. Society For Inclusive Development (SFID), Dehradun, in association with Bangalore-based NGO Strides Foundation, have constructed four anganwari centres in the disaster-affected Uttarkashi district. The SFID had conducted a survey in the Didsarim Mori, Purola and Joshiyara blocks of Uttarkashi before starting construction work. 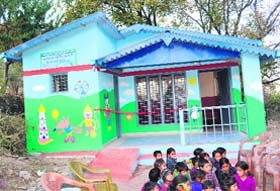 The new anganwari building constructed by Strides Foundation, Bangalore, and Society for Inclusive Development, Dehradun at disaster-hit Purola in Uttarkashi district. Chief Minister Harish Rawat addressing a rally on creating awareness towards water conservation in Mussoorie today announced bonus and relaxation in the electricity and water bills for those consumers who are able to practice rain harvesting in the state. The ‘Commotion in the Ocean’ created ripples of excitement and exhilaration among all those who watched the annual day function presented by St Patrick’s Academy here today. 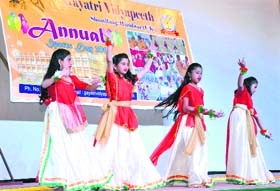 Multi-cultural and sporting activities marked the concluding day of the two-day annual festival of Gayatri Vidyapeeth Vidyalya, educational wing of Akhil Vishwa Gayatri Parivar, Shantikunj, here today. Governor Aziz Qureshi yesterday said the uniqueness of India lay in its unity in diversity and “our cultural heritage is also a great attraction for the entire world”. The Governor was speaking at a mushaira and kavi sammelan organised as part of the “Sharadotsav” in Nainital this evening. The hunger strike by the National Students’ Union of India (NSUI) continued for the fourth consecutive day here. The agitators sought to improve infrastructure to accommodate students in the evening classes in DAV (PG) College and increase the number of seats from 960 to 3,200 for graduation courses. Summer Valley School won the inter-school quiz competition held at St Thomas College during the school’s ongoing annual fest ‘Spectrum-2014’ here today. St Joseph Academy bagged the second position in the quiz competition. The Welham Girls School won a special quiz competition on William Shakespeare organised in the city by Cambrian Hall School in association with Oxford University Press India here today. About 35 prominent schools from across the district participated in the competition. The cost of woollen products manufactured by tribal craftsmen using rough Tibetan wool brought from Tibet has risen this year as cost of Tibetan Yuan has gone higher in terms of the Indian rupee since the last year, according to traders selling items made of Tibetan wool at the Jauljibi fair. A campaign kicked off at Almora today against capital punishment to Nithari killer Surendra koli on the ground that he was a poor person and had been implicated in the case while the actual culprits being influential were roaming free. A large number of protesters under the banner of the Uttarakhand Rajya Andolankari Sanyukt Sangarsh Samiti, gheraoed Chief Minister Harish Rawat and submitted a memorandum here today. 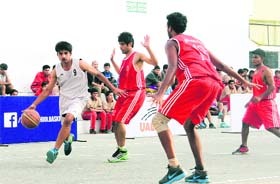 Quarterfinal matches were played in the ongoing Indian School Basketball League organised by Uttarakhand Basketball Association and District Basketball Association with the help of Basketball Federation of India at Doon International School here today. The first and second grade students from Garhwal English Medium School (GEMS), along with their teachers, spent half a day at the resort and participated in the activities that involved arts and crafts as well as games for children. The children also enjoyed their time at the kids’ play area of The Den, the 12,000 sq ft entertainment centre with games, carousels, toys and a well-stocked library. The hotel’s employees interacted with the children and ensured that their day was special. The children ended their day at the resort with a nutritious lunch laid out at the grand ballroom. According to the staff from Garhwal English Medium School (GEMS), a non-profit school that provides education to underprivileged children in the region, the children enjoyed and had a fun-filled day at the resort as it was a new experience for them on Children’s Day. “In line with Marriott International’s long standing philosophy of ‘Spirit to serve our Community,’ we at JW Marriott, Mussoorie Walnut Grove Resort & Spa, are eager to lend our support towards the local community. It was heartwarming to see smiles on their faces. It was truly the biggest reward for us. Going forth, we will continue to use our resources to make a difference in the local community,” said Chandrashekhar Joshi, General Manager, JW Marriott, Mussoorie Walnut Grove Resort & Spa. Children’s Day was also celebrated at Jawahar Aquarium where the schoolchildren along with members of the Congress Party garlanded the statue of Jawaharlal Nehru and shed light on the life of the great leader.MLA, Mussoorie, Ganesh Joshi, celebrated Children’s Day by announcing to give 4 computers and 50 pieces of furniture to Government Girls Senior Secondary School at Hathibarkala. Children enjoyed at the kids’ play area of The Den, the 12,000 sq ft entertainment centre with games, carousels, toys and a well-stocked library. Society For Inclusive Development (SFID), Dehradun, in association with Bangalore-based NGO Strides Foundation, have constructed four anganwari centres in the disaster-affected Uttarkashi district. The SFID had conducted a survey in the Didsarim Mori, Purola and Joshiyara blocks of Uttarkashi before starting construction work. As land was not available in other regions, Purola in Uttarkashi district was finally identified and selected. A memorandum of understanding was signed with the Uttarkashi district authorities on January 27, 2014. The construction work began in May after approval for the design and structure was obtained. Now, the SFID completed the construction of four anganwaris at Sunali, Mairana, Srikot and Nagjhala and handed these over to the district authorities on November 12 in the presence of local MLA Malchand, Congress leader Suryakant Dhasmana and other dignitaries. The MLA said at Purola that he would make arrangements for getting gas connections for all anganwaris and financial support for the construction of pavements in front of these. Dhasmana assured the aganwaris of two computers for each of them. Dr Sathyanarayan, managing trustee, Strides Foundation, along with Anil Jaggi, president of the SFID, formally announced the completion of four anganwari centres in Dehradun yesterday. He said 2,000 employees of Stride Arcolab Ltd, Bangalore, had shown willingness to support the victims of the natural disaster that struck Uttarakhand in June last year. The Strides Foundation and the SFID would take up the reconstruction of four other anganwaris at Chandeli, Kufara, Bichlamath and Hudoli in Uttarkashi district. The rally was organised by Mussoorie Congress Party unit under the leadership of their president Satish Dhaundiyal at Mussoorie and attended by around 1500 students from 13 schools. It began from Survey Chowk in Landour Bazaar and carried on till Library Chowk today. The students carrying placards of save water raised slogans to create awareness towards rain harvesting in the region. The band from the Guru Nanak Fifth Centenary School mesmerised the audience with scintillating music. The Congress president from Mussoorie, Satish Dundhiyal, thanked the Chief Minister Harish Rawat for sanctioning the Rs 200 crore project for supplying potable water from Yamuna to Mussoorie. CM Harish Rawat, addressing the students, thanked them for their enthusiasm towards conserving water and environment, respectively, and said that the state can benefit immensely from practicing rainwater harvesting. Rawat said that it was pleasing to note that the campaign of conserving water and promoting rainwater harvesting is beginning from Mussoorie and hoped that it would spread across the state. Rawat said that it was from Mussoorie that former Prime Minister Indira Gandhi began the campaign of water conservation and saving environment. He also said that with the start of this campaign from Mussoorie the state will become first to conserve water in the country in a big way. He also said the cost of supplying water from Yamuna would be high and the people of the town should be prepared to pay extra cost once the project is completed. He also said that the consumers should try to save water through rainwater harvesting and if they do so intensively, the state government will compensate them by giving relaxation in electricity and water bills, including other benefits, too. The students also pledged to conserve water in order to save environment and resolved to plant more trees on the occasion. MC president Manmohan Singh Mall, senior Congress members Bhagwan Singh Dhanai, BP Kukreti, Ramprasad Kavi, Beena Mall, Megh Singh Kandari, Arvind Sonkar, Beena Panwar, Sashi Rawat, Jaipal Rana, Praveen Panwar, MC ward members Anuj Gupta, Nand Lal,Kuldeep Rawat, Rakesh Bhadola, MPG college president Ritesh Rawat, Amit Bisht, Mohan Phelwan,Sandeep Thapli, Subash and others were present on the occasion. Notwithstanding the November chill, parents filled the arena to its maximum capacity. The event was graced by Education Minister Mantri Prasad Naithani as the chief guest. The programme started with the lighting of the lamp followed by a soulful performance on a prayer song, ‘You are Amazing’ presented by UKG children, leaving the audience enthralled. School coordinator Sheetal Negi presented the school report and provided a glimpse into the plans for the forthcoming academic year. This was followed by the much-awaited musical play, “Commotion in the Ocean”. The play transported the audience into an underwater world as children dressed as different sea animals came on the stage to perform. The evening witnessed a colourful array of mesmerising dances and dazzling performances as a water world literally came alive on the stage. The highlight of the programme was the ‘celebration dance’ where all students of the school came up on the stage together to show their solidarity and enthusiasm. The chief guest highly commended the performers and spoke about the evolving education system in India in which children are given opportunities to learn in such ways. Clean India campaign, being spearheaded by Prime Minister Narendra Modi, was highlight of the cultural programmes as students depicted cleanliness themes in various enactments, generating awareness about the necessity of the campaign. Kathak dance presentation on Gayatri mantra hymn by tiny tots was also lauded along with deity Ganesh,deity Saraswati recitation. A dance based performance on Himalayan Kumbh-Shri Nanda Devi Raj Jat Yatra was also one of the major drawers at the cultural presentation. 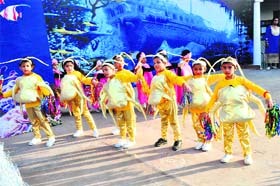 Enactment on Krishna Lila, jingle bell and Punjabi Gidda by students were also highly praised by the audience present. Nitya, Ahuti Pandya, Shristhi Aggarwal, Vasundha, Ritu, Devasya, Harishit, Geetika, Jahnvi, Yogehswari, Parth, Pragyesh and Shubanshu’s performances were much applauded. The programme was coordinated by Richa Patel and Poornima Singh. Chief guest Dev Sanskriti University Pro Vice Chancellor Dr Chinmay Pandya in his address appreciated the enthusiasm and talent of the participating students.He also gave away prizes to the students who emerged winners in sporting and cultural activities. Registrar of the university Sandeep Kumar, Shefali Pandya, member of the school management committee,Gayatri Vidyapeeth school staff members and people from Haridwar city, Kankhal, Bhoopatwala, Sapt Rishi, Shyampur, Raiwala and Shantikunj attended the two-day annual festival. He said poets had always provided guidance and a new direction to society and the country. “Hindi and Urdu poets wrote inspiring poems and songs and contributed to the freedom movement,” he said. About the history and culture of Uttarakhand, he said the folk songs, Jagar and yatras played an important role in attracting tourists and pilgrims. He added local artists and talents should be given more encouragement. Well known poet Akhtar Gwaliori chaired the mushaira while Justice Jasmine Ahmed was the special guest. Afzal Manglauri (who conducted the mushaira), Akhtar Gwaliori, Dr Yunus Farhat, Azhar Inayati, Om Prakash Noor, Dr Anjum Barabankwi, Dr Nirmal Darshan, Naeem Rashid, Shafiq Abdi, Popular Merathi, Nadeem Banni, Dr Nusrat Mehdi, Dr Mamta Singh, Ahsan Warsi, Pankaj Prasoon, Savita Aseem, Dr Anita Soni, Moin Shadab and Dr Kunwar Bechain took part in the mushaira. Student leaders under the banner of the NSUI sat on a dharna on the DAV college premises and raised anti-college slogans. The agitators said a memorandum highlighting their demands was given submitted to the college administration several times, but steps were yet to be taken by the college administration to fulfill their pending demands. The agitators said repair of damaged infrastructure, including classes and laboratory, restart of construction of indoor badminton court etc, should be done on priority in order to avoid inconvenience to students. The agitators said DAV (PG) college principal Dr Devendra Bhasin had assured them of fulfilling their demands, but steps were yet to be taken by the college administration. Notably, six schools, including St Joseph’s Academy, Summer Valley School, Carman School Dalanwala, St Thomas College, St Jude’s School and Raja Ram Mohan Roy Academy, participated in the quiz competition. Sahni of St Thomas College was the quiz mistress and there were a total of 10 rounds comprising current affairs, science, hide and seek, sports, audio round, dumb charades, numerical ability, computers/IT, visual round and rapid fire round. Chief Guest Meenakshi Saxena, who is the Principal of Touchwood School, gave an inspiring speech, encouraged and stimulated students and applauded the manner in which the competition was conducted. St Thomas College Principal RV Gardner gave the vote of thanks at the end. “The cost of jackets, fibre quilts, blankets and track suit imported from Tibet via Indo-Tibetan trade this year has risen by 15 to 20 per cent this year as cost of Tibetan Yuan has increased in terms of rupees,” said Gelmu Lama, a Nepali citizen who has opened a shop of Tibetan items at the fair this year. The impact of increased prices of woollens in Tibet is also visible in other woollen items manufactured by tribal traders of Drama valley who have set up 25 shops of local hand-made products using Tibetan wool. “We are selling a Thulma (blanket made out of Tibetan sheep wool) for Rs 1,800 this year. It was sold for Rs 1,000 last year,” said Kailas Khampa, a tribal trader who is selling items made of local woollen craft. Besides tribal traders who have brought local craft-based items to the mela, traders from Jammu and Kashmir, Himachal Pradesh, Punjab, Haryana, Rajasthan and Gujarat, besides those from parts of UP and Uttarakhand have reached the fair. CM Harish Rawat announced last evening that the government had declared the fairs of Gauchar and Jauljibi as government fairs and expenditure therein will be taken care of by the government from next year. “We have appealed to the legal authorities concerned to consider our views on the discrepancies in justice delivery with regard to those convicts who are not in a position to bear high cost of fighting cases, said Dr Pankaj Bisht, a campaigner who reached Almora today. Bisht, editor of Hindi magazine ‘Samayantar’ and writer, said rich and influential people involved in the killings had got Surendra Koli implicated to escape gallows themselves. The incident took place when the Chief Minister was attending a public function on Chander Road. The protesters demanded a special status for statehood agitators. Samiti spokesperson Nitish Saklani said they had demanded jobs for the dependents of statehood agitators and an early completion of identifying the agitators. “Until our demands are met, we would continue to gherao the Chief Minister and Cabinet ministers. We have planned to stage a protest demonstration outside the district headquarters on November 17 across the state. If the demands are still not met, we would be restoring to ‘chakka jaam’ in the state and proceeding on an indefinite hunger strike,” he added. Lambasting the state machinery, Saklani said while the state government and its ministers were busy in filling their pockets by engaging in illegal activities, no heed is being paid towards the statehood agitators who have given their sweat and blood towards the creation of the state. Those who were part of the demonstration included Nandabhallbh Pandey, Vipul Nautiyal, Prem Singh, Sunil Juyal, Veer Singh, Vinod Aswal, Goving Singh, Vasudha Negi and several others. In the first quarterfinal, The Asian School defeated Tibetan Children’s Village by 29-22 points with Jaskaran scoring maximum 13 points for The Asian School. Kunsang from Tibetan Children’s village scored 10 points for her team. Hilton School won its match against Pestle Weed School 26-21, with Steven scoring 10 points in the match for Hilton School while Rahul scored 7 points for Pestle Weed. In the 3rd quarterfinal , The Doon School defeated Raja Ram Mohan Roy Academy by 27-9 points in which Karan of The Doon School scored maximum 9 points. Hosts Doon International School also entered the semis, defeating The Aryan School 47-14. Shubhav scored maximum 16 points for Doon International School.